The very first festival of the year takes place in the Bolyki Valley. The programme promises a dynamic start to the festival season with Hungarian bands such as Wellhello, Irie Maffia or Blahalousiana; and some really great wines as well. Combine it with some sightseeing in Eger, and the great experience is guaranteed. “Ride into the summertime” with Hungary’s largest biker festival, which is loud of both engine sounds and music. Among the performers will be the famous Hungarian rock band Tankcsapda and big international names such as Apocalyptica and Canned Heat. A festival made special not only by a wide range of genres but also by its cosy atmosphere and closeness to nature. Enjoy some concerts while bathing in the Lake of Orfű, and do not be surprised if you keep running into the musicians while waiting for your beer. Hungarian bands dominate the programme, so it is a great opportunity to get acquainted with our famous and our up-and-coming favourites as well: 30Y, Ivan and the Parazol, Kiscsillag from the headliners, Middlemist Red or Fran Palermo to name just a few of the young talents. As one of the largest in Hungary, the ever-growing festival does not need much introduction anymore. VOLT festival offers a lively setting for entertainment and socialising, and the line-up speaks for itself: Depeche Mode, Iron Maiden, Avenged Sevenfold, Limp Bizkit, Hurts… and we are just getting started! Read more news about VOLT FESTIVAL. The most fabulous beach party in Hungary. For those keen on electronic music, the southern shore of Lake Balaton is the place to be in July. Drink a cocktail or have some fun in the water and enjoy the party provided by David Guetta, Rita Ora, Big Sean or the Chainsmokers, just to name a few. More news about BALATON SOUND. Fans of punk, rock and metal music can let the steam off together in a six-day-long marathon. The festival righteously calls itself the “Rockparadise in the heart of Hungary”. The list of artists include Cannibal Corpse, Alestorm, Iced Earth, and they offer thematic days such us Folkmetal Friday. Yet another lake festival, EFOTT is an excellent student party next to Lake Velence. Only 45 kilometres away from Budapest, in a friendly environment, with the mixture of Hungarian household names – Punnany Massif, Halott Pénz, Rúzsa Magdi, Brains – and international stars like Jessie J, John Newman and Dub FX, the fun is guaranteed. A premium music festival celebrating its 15th jubilee awaits lovers of soul, blues and jazz music, with top names and excellent wines. This year prominent opera singers will also perform such as José Cura, Erika Miklósa, Ramón Vargas or Andrea Rost. 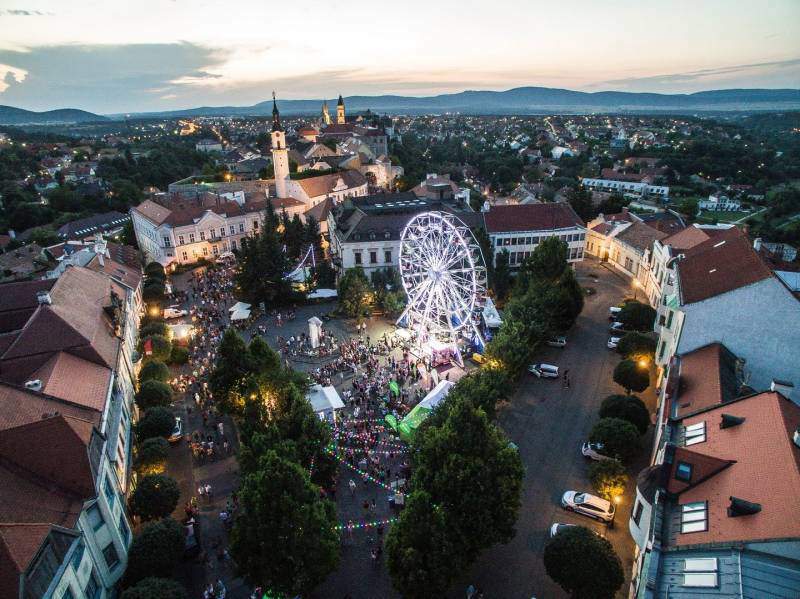 Once you are in Veszprém, do not go far, as the Street Music Festival starts just a few days after VeszprémFest. There are concerts and programmes all over the historic city, offering an atmosphere of familiarity and freedom – and indeed, the festival is free. Artists coming from an impressive variety of countries perform around the clock. A festival at the Great Forest to enjoy music and gastronomy as well. The hit names this year include Akon, Sigma and Ignite. Several Hungarian musicians and bands prepare special jubilee concerts, such as Ákos, Tankcsapda or András Lovasi. The festival promises a record number of Hungarian bands. An extraordinary festival for the whole family spread around Kapolcs. Here tradition meets modern life, with workshops, handicraft stalls and concerts both Hungarian and international, like Rebecca Fergusson. The Valley of Arts awaits the youngest as well with special children programmes. Székesfehérvár is one of the largest Hungarian city, rich in historical heritage. It is located halfway between Budapest and Lake Balaton, close to Lake Velence, but more importantly has its own ground shaking festival, FEZEN. The big names this year include The Prodigy, Enter Shikari, Pitbull and Epica. A unique festival located in four villages in the wine region of Baranya county. Ördögkatlan provides a colourful spectrum of cultural programmes, including circus, literature, fine arts, theatre and, of course, music. A multicultural and peaceful festival for all, with international and Hungarian performers. The island of freedom is, by all means, the largest and most famous festival in Hungary. Seven days full of programmes, boat parties, performing arts, concerts, “Art of Freedom” exhibition, living statue championship and so on. To make the most of your time, you can buy a city pass, which allows you to visit certain spas and use shuttle buses free of charge. What better way to rest between concerts? Speaking of music, just a few of the headliners: Arctic Monkeys, Lana Del Ray, Shawn Mendes, Mumford and Sons, Kygo, Dua Lipa, etc. Read more news about Sziget Festival HERE. SOUND festival is not the only beach festival in Zamárdi; the Strand Festival is also becoming more and more popular. Robin Schulz, Sigala, and Thirty Seconds to Mars will make sure that everyone ends their summer on a high note. That is right, same date, same lake but two awesome festivals. B.my.Lake takes place parallel to Strand Festival, and if you are into electronic music, then this is your place. Among others, Richie Hawtin, Marco Carola and Maceo Plex await the party animals. The longest-running festival in Hungary is for all who are young in soul and mind. The riverside event hosts concerts of mainly Hungarian bands like Csík zenekar, Quimby, Paddy and the Rats, PASO and their programme is not even complete yet! These were, of course, only the largest music festivals, but make sure to check out other ones as well, such as the Lavender Festival, the Open-Air Festival of Szeged, the Flower Carnival, and all the other sport and culinary events. We hope to have sparked your interest with our overview. Let us face it, the decision will not be easy, but wherever you decide to go, we wish you a wonderful time.